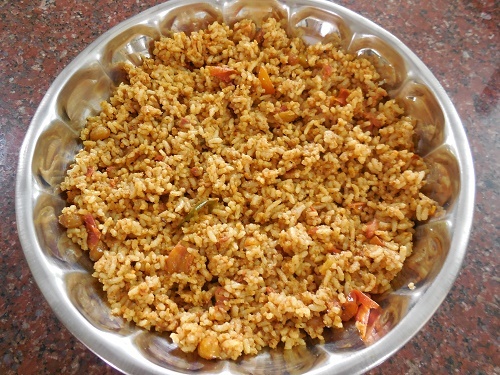 Among the various kinds of variety rice preparations(Chitraanna), Tomato Rice is the easiest to make. It is often served in South Indian Thali Meals along with numerous other dishes.Tomato Ogare is a variation where tomato gojju is cooked with a flavoursome blend of spices and mixed with rice making it more spicy, flavoursome and festive. 1. Dry roast sesame seeds till they splutter. 2. Dry roast fenugreek seeds till they turn dark brown in colour. 3. Dry roast pepper and cumin seeds till you get a pleasant aroma. Powder all the dry roasted ingredients together and keep aside. 4. Heat 1/4 tsp of sesame oil in a pan and roast coriander seeds, Bengal gram dal, Black gram dal and broken red chillies together till they turn golden brown in colour emanating a very pleasant aroma. 5. Allow to cool and then grind the roasted ingredients into a slightly coarse powder. 6. Add the grated copra and give it a final blend. 1. Heat oil in a kadai and add the mustard seeds. 3. When the mustard splutters add the ground nuts and fry till they crack. 4. Add curry leaves and asafoetida followed by the finely chopped tomatoes. 5. Stir in turmeric powder, salt and jaggery powder. 6. Cover and cook on low flame, stirring now and then till the tomato becomes mushy and the oil separates. 7. Mix in the prepared spice powders and switch off flame. Now the Tomato Gojju is ready to use. 1. Take one cup of cooked rice in a wide bowl and break up the lumps if any. 2. Add one spoon of sesame oil to the rice and mix well so that each grain is coated with oil. This step prevents the rice from clumping. 3. Add 3 or 4 table spoons ( or as per taste) of the prepared Tomato Gojju and mix evenly with the rice using a spatula. Enjoy the flavoursome Tomato Ogare with cucumber raita and papad. 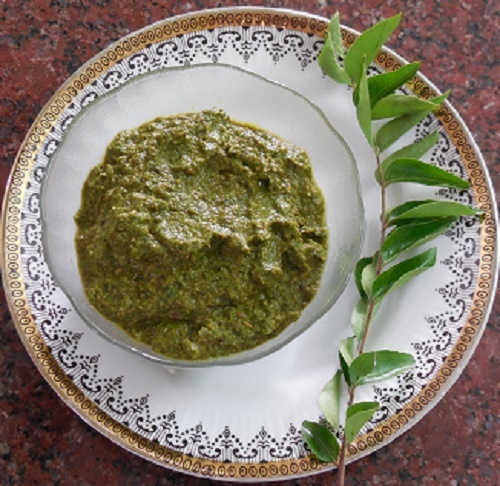 Karuveppilai / Karibevu / Curry leaf is an indispensable herb used extensively in South Indian cooking. It is used to season or garnish almost all the dishes prepared every day. Karuveppilai is used as a home medicine for colds, loss of appetite, indigestion or biliousness. According to Ayurveda Karuveppilai is a blood purifier and helps in preventing anemia. It helps in maintaining the healthy functioning of almost all the organs like pancreas, liver and kidney. Eating a fistful of curry leaves on an empty stomach every morning assures one of a disease free life. Most people discard Karuveppilai seasoning while eating a meal, without caring for its abundant health benefits.The best option to utilize and enjoy all the health benefits offered by this flavoursome and humble Karuveppilai is to include a liberal quantity of Kariveppilai Chutney in your meals as often as possible. 1. Separate the Karuveppilai or Curry leaves from the stalk and wash thoroughly. 2. Heat oil in a pan and add Bengal gram dal and Black gram dal and roast till they change colour. 3. Add pepper and cumin seeds and fry till they emanate a pleasant flavour. 4. Add broken red chillies followed by asafoetida. 5. When the chillies turn crisp add the washed and well drained Karuveppilai and stir till the leaves wilt. 6. Shred the tamarind and add it to the roasted ingredients and switch off flame.The heat in the pan will soften the tamarind. 7. Allow to cool and then grind all the ingredients with salt to a coarse powder. 8. Add water little by little to the coarse powder and grind smoothly into a fairly thick Chutney. Enjoy the flavoursome and delicious Karuveppilai Chutney mashed with steaming hot rice and a spoon of ghee. Chutney rice can also be prepared and served as a fancy Variety Rice (Kalanda Sadam). Fluff up two cups of cooked rice in a bowl. Add two pinches of turmeric on top. Heat two spoons of ghee and pour the hot ghee on top of the turmeric powder. 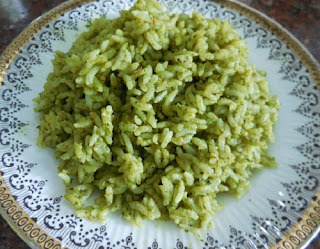 Mix well so that each rice is coated with turmeric powder and ghee. 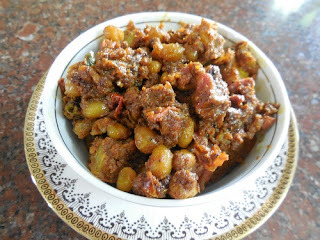 Add a spoon or more of Karuveppilai Chutney (depending on your taste) and mix well without mashing the rice. 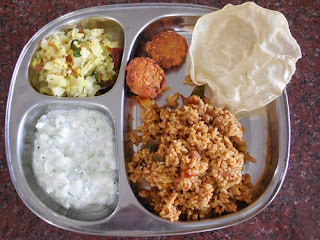 Enjoy the Karuveppilai Chutney rice with Papad or any Raita of your choice.